Lazio has a famous tradition of curing meats that stretches back to the early Middle Ages (when salumi was used as a form of currency). 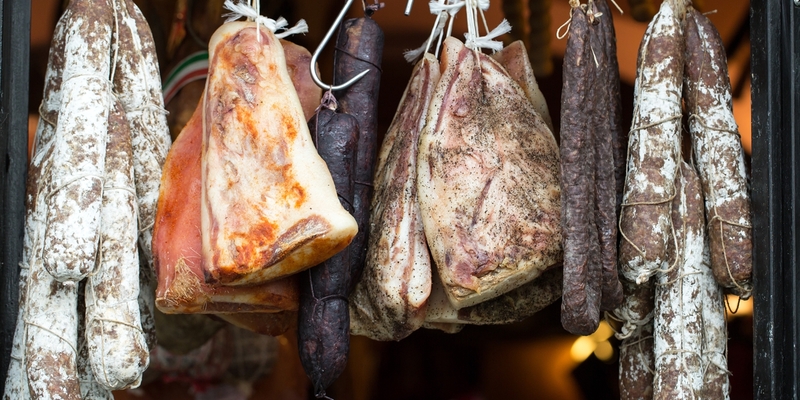 We take a look at some of the region’s favourites, from guanciale to prosciutto. Lazio has historically been a region with a huge gulf between rich and poor – whilst the former could afford to eat handsomely, the peasantry were forced to scrimp for their meals. As a result, this region has a reputation for simple, thrifty cooking – nothing goes to waste here, even now. The Italian curing tradition was born out of this sort of efficiency, and in Lazio, curing meat became a vital way of preserving food for the winter. Whilst the upper classes would take the prime cuts of meat, the poor would be left with unwanted offal and tougher cuts, and would cure them to make them palatable. Lazio doesn’t suffer from the same extreme poverty gap these days, but the locals still love their salumi and their offal – lots of the traditional dishes of the region use salumi in some form, and you’ll often see them served as a simple snack if you stop somewhere for a drink. You’ll find all your common Italian cured meats as you travel across the region, but there are a few special, traditional Lazian salumi you should keep an eye out for. Read on for five of our favourites and be sure to stock up on them whenever you pass a deli. 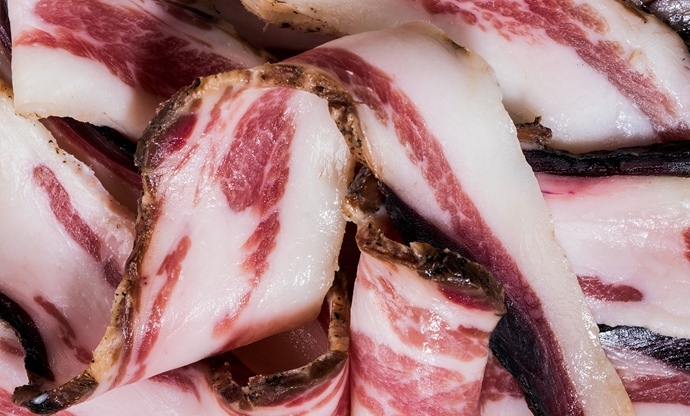 Guanciale is indispensable to Lazian and Roman cooking – this pork salumi contains a thick layer of very porky fat, which when rendered into a pan, becomes the lifeblood of classic Lazian dishes like spaghetti alla Carbonara, pasta alla Gricia and bucatini all’Amatriciana. If you’re going for a true taste of Lazio, nothing else will suffice! Guanciale is made from fatty pork cheeks – first they’re washed in wine, then they’re heavily seasoned with salt, pepper, sugar, herbs and spices and left to cure for three to four weeks, before being hung to dry. You can eat guanciale raw, but much like lardo di Colonnata, guanciale is best used for cooking – using the pork fat instead of oil will give your dishes an incredible porky depth of flavour. Mortadella started life in Bologna, but such is the popularity of this pork luncheon meat, it's now made all over Italy. Amatrice is a real gastronomic centre in Lazio – as well as being the home of pasta all’Amatriciana, it’s also the home of two of Lazio’s most popular salumi. Mortadella di Amatrice is made using ground meat from the loin and shoulder, which is seasoned with salt and pepper, and left to cure inside a casing of cow’s intestine. They’re pressed under heavy weights, and then left to dry for three to four months before they’re ready for consumption. 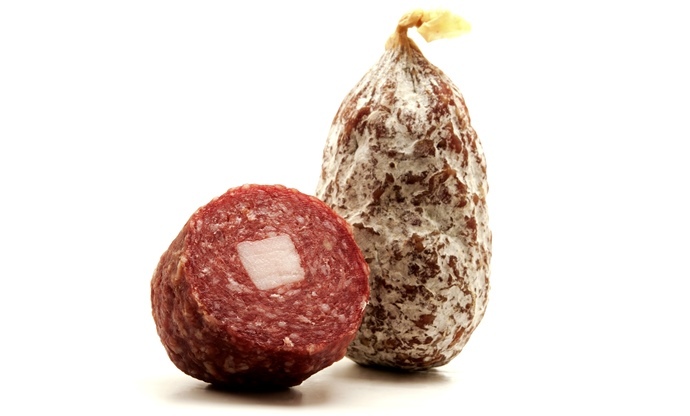 Mortadella di Amatrice comes out more fully-flavoured and spicier than traditional Mortadella, and has a darker colour too, almost like a French saucisson. It's very similar to Mortadella di Campotosto, made just across the border in Abruzzo, and can come with a central stick of pork fat through the centre, as pictured above. 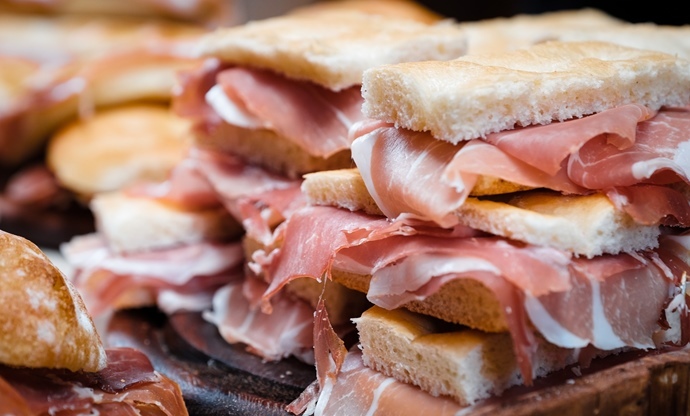 Prosciutto has been an important part of life since the middle ages in Lazio – evidence from as far back as 1327 suggests that cured hams were used as currency in the region, when feudal lords would demand them from vassals as tax. You’ll struggle to pay for anything with a ham these days, but they’re still worth their weight in gold in a gastronomic sense! Amatrician ham is now PGI protected, and only made from a select range of traditional southern Italian pig breeds – Durocs, Landraces and Large Whites specifically. The ham is trimmed quite heavily to remove much of the fat and rind around the top – this gives prosciutto di Amatrice its distinctive pear shape – before being salted twice over the course of two or three weeks. The ham is then washed and dried, before being covered in a layer of lard, salt, pepper and spices and left to cure for around twelve months. This chewy pork jerky originates from the beautiful Castelli Romani – a collection of small towns in the south-east of Rome. Coppiette is probably the least-known of Lazio’s salumi and as a result, perhaps the hardest to find, but it’s worth hunting out if you enjoy jerky-style snacks. 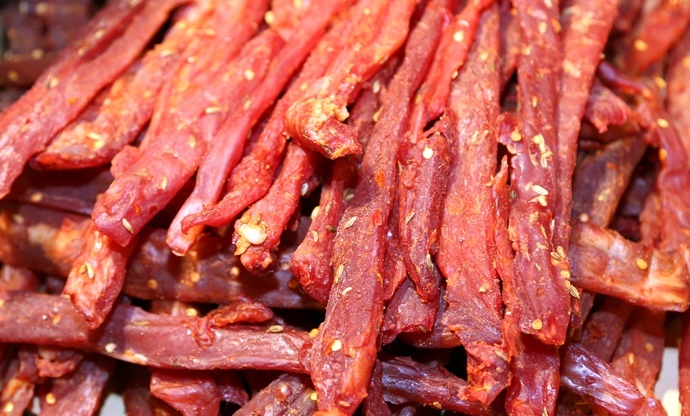 Originally, coppiette was made from the tougher, sinewy bits of grazing animals like goats, sheep, donkeys and horses – the meat would be sliced into thin strips and cured in salt, fennel seeds and chilli flakes – ‘peperoncino’ to Italians – before being dried and kept for the winter months. These days coppiette is made from pork tenderloin rather than offcuts from other animals, but the production process is much the same. They make fantastic pub snacks, enjoyed with a glass of red wine and a bit of fresh bread. 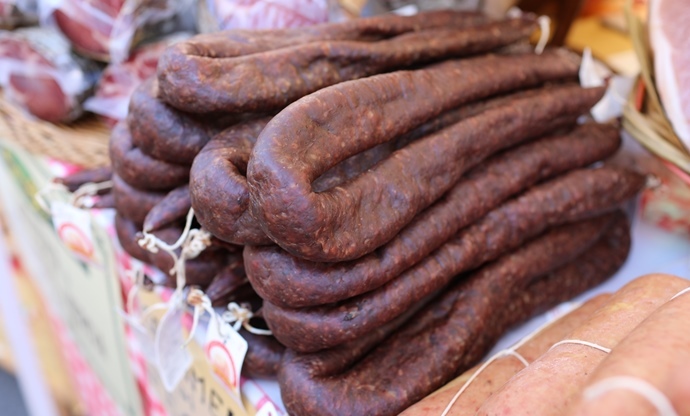 This pork offal sausage is a great example of how people in Lazio let nothing go to waste. Less popular cuts like heart, liver, pancreas, belly, cheek and others are ground down together, seasoned with salt, pepper, fennel and peperoncino and left to cure in pig casings for anywhere between one and six months. As the sausage cures the colour of the flesh darkens and the offal flavours intensify, with the oldest sausages picking up earthy chocolate flavours – if you’d prefer a lighter flavour, look for something younger.